White Wine Sangrias are fruity and lighter than their red counterparts but can still pack a potent punch. 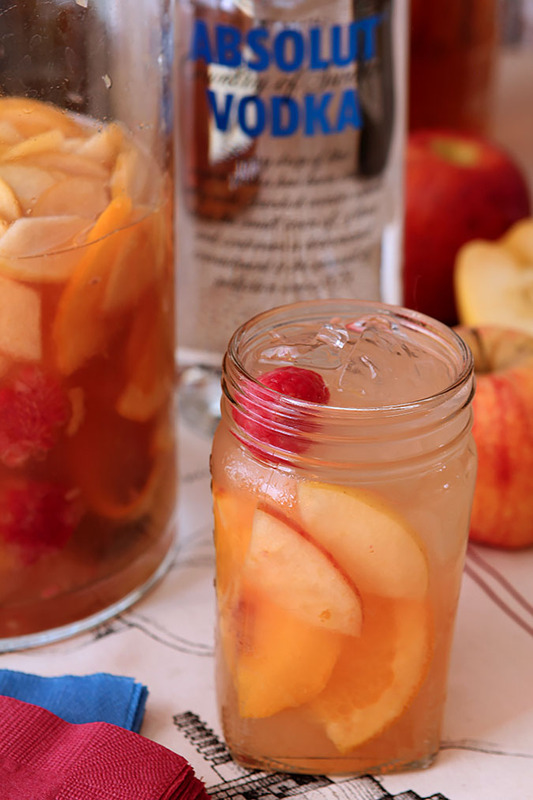 Try this Hard Apple Cider Sangria for your next event or football viewing party. For all of the combinations I’ve put together over the years, the one thing I’m not crazy about is a red wine sangria. Maybe I just prefer my red wine plain? But I love making sangria all year round with white or sparkling wine. It complements fruit so well, eliminates some of the dry qualities I don’t love with whites and can easily be changed up with different fruits and liqueurs. For this sangria, I added a bit of vodka to the hard apple cider and sparkling wine. 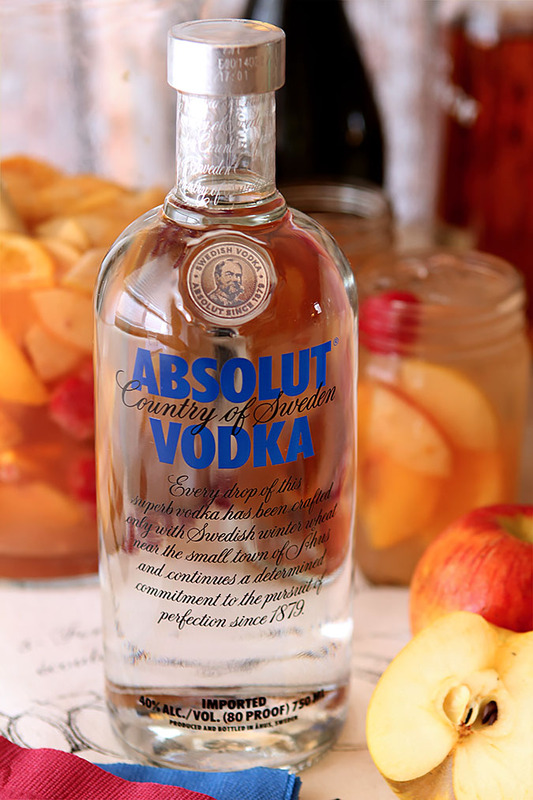 Absolut is a favorite of mine; it’s smooth, mixes well and has a great price point. I’m not as enamored of all of the available flavors, preferring to both flavor my cocktails with real fruit and quite honestly not have to stock my bar with a dozen different flavors! 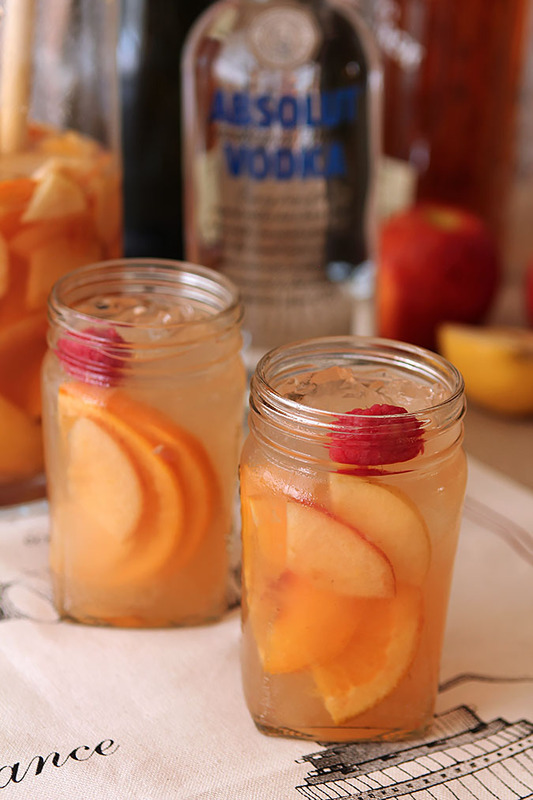 You really can mix up the fruit in this Hard Apple Cider Sangria. Of course I think apple is a necessity but beyond that I had a couple of peaches, some oranges, a pear and some raspberries in the fridge…so in they all went. If there is one downfall to a sangria, it’s that it’s meant for a crowd; I would love to make just one of these just for me more often! Cheers! Place the sliced fruit in a large pitcher. Add the vodka, hard apple cider, apple brandy, honey, and cinnamon sticks. Let the fruit, syrup and liqueur macerate for at least 30 minutes. Add the sparkling wine and mix gently. Taste and adjust the amount of sweetness, using the simple syrup as needed. Serve the sangria in individual glasses over ice and top with the sparkling apple soda. Garnish with fruit or cinnamon stick. For a non-alcoholic version, omit the Calvados and replace the hard cider with sparkling apple cider. The sparkling wine can be replaced with sparkling lemonade or even a lemon-lime soda. Taste first before adding the simple syrup since those drinks are already quite sweet. I do like red wine sangria, but there are a LOT of really bad versions of it out there. Not yours, of course. 🙂 This looks terrific — apple cider in sangria? Yes! Maybe that’s the real problem; I’ve not had any I enjoy? I think it goes back to my twenties when people made it with cheap wine. Guess I should give it another shot but it just left such a bad taste in my mouth I haven’t had the interest!